With his usual critics busy battling the home-rule district threat, Mike Miles’ pay-for-performance plan for DISD teachers sailed through. Superintendent Mike Miles achieved a major piece of his reform plan for Dallas ISD when the school board approved an evaluation system that ties teacher pay to performance. Trustees voted 7-2 late Thursday to end the standard practice of paying teachers based on years of service and college degrees. 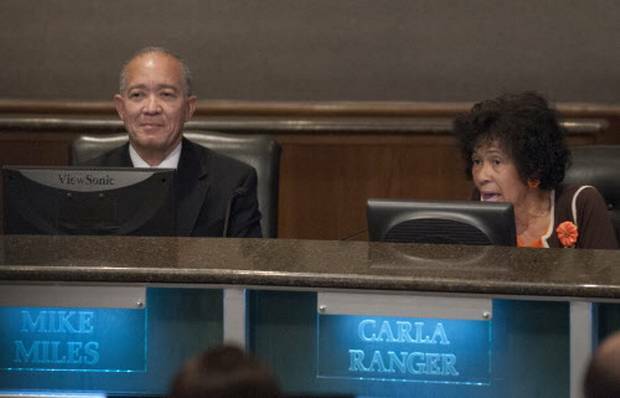 Trustees Bernadette Nutall and Carla Ranger voted against the measure. They questioned whether a pay-for-performance system can improve student achievement. Mayor Mike Rawlings has staunchly supported Miles and his Destination 2020 reform plan. He applauded the board for approving the new evaluation system, called the Teacher Excellence Initiative. The new system will start in the 2014-15 school year. Changes to the salary structure will launch in 2015-16. The change comes as Dallas ISD is undergoing a process that could place the district under a home-rule charter. Such a charter could change the way the district is operated and governed and would allow it to ignore some state mandates. The group Support Our Public Schools initiated the home-rule effort and turned in enough signatures last week to force the next step. Trustees now have 30 days to appoint a 15-member commission that will create a charter. A majority of voters must approve the charter in an election with at least a 25 percent turnout. Some observers say the home-rule issue overshadowed the teacher evaluation proposal, making it less controversial than expected. It remains to be seen whether the board’s approval of the new system bolsters claims by home-rule opponents that big changes can occur under the current system. “It’s clearly a significant change in policy,” said Dallas attorney Mark Melton, who offered a compromise charter in an attempt to bring both sides together. “If you are going to make an argument for home rule, certainly there are things that you can do that you otherwise cannot do. This doesn’t happen to be one of those things,” he said. Trustees heard a mix of opinions from teachers and others Thursday before voting on the evaluation system. Rhonda Barnwell, a DISD instructional coach, spoke in support of the change. School librarian Hobie Hukill disagreed. He warned that more teachers would leave under the new system. “If TEI passes tonight, the teacher exodus will continue,” he said. Miles has said he believes the new evaluation is the most rigorous in the U.S. Under the plan, teachers will receive more thorough observations and more feedback. Miles said after the meeting that he is encouraged by the show of support from the trustees on such a big change. Miles said that while DISD has some great schools, not all 160,000 students are getting the best education. The latest STAAR results show that DISD elementary and middle school students improved on the math exams this year but did not make gains in nearly all other subjects, especially reading. Under the new system, teachers will be paid based on points received in their two most recent evaluations, except in the roll-out year when only first-year ratings will be used. Their pay would not drop below their 2014-15 salary. Classroom performance will make up 50 percent of the evaluation for most teachers. Student test scores will account for 35 percent, and student surveys will make up 15 percent. Ratings range from “unsatisfactory,” with a $45,000 salary, to “master” at $90,000. Teachers new to the profession will come in at the “novice” level and be paid $47,000; those with experience could come in at higher levels. Teachers currently making below $47,000 will be brought up to the “novice” level. The district has said that 28.5 percent of its 10,000 teachers make under $47,000. Before teachers reach the “proficient II” level ($59,000), they would have to go through a “distinguished teacher” review. The top level, “master,” requires two years at the “exemplary II” level and at least four years as a “distinguished teacher” in a low-rated school. To control costs, there will be a “target distribution” for each level. For instance, the district could say that no more than 40 percent of teachers can be at the “proficient I” level, which has a $54,000 salary. The district could also control costs by adjusting pay for the rating levels. And, normal attrition is expected to help contain pay levels and costs. Miles expects teacher salaries to continue to account for about 47 percent of the budget. Teacher salaries next year will cost about $560 million. Trustees had nearly a two-hour discussion about the evaluation before taking a vote. Ranger, who voted against it, cited various concerns and questioned whether merit pay systems work. “As I look at this one, I see that this can lead to diminished cooperation among teachers. It can lead to less collaboration. It could lead to cheating,” she said. Trustee Nancy Bingham, who backed the plan, noted that younger speakers were more supportive. She said they would be paid on their worth under the new system. Staff writer Matthew Haag contributed to this report. Just a simple question……..what happens to the teachers who are not performing up to a minimum defined standard? Some students are self-motivated to learn but many are not so motivated. Being motivated to learn is the fundamental key to increased klnowledge. Knowledge is not gained like pouring water out of a bucket into a tub. How will teachers be assessed to determine the quality of their student motivational skills?